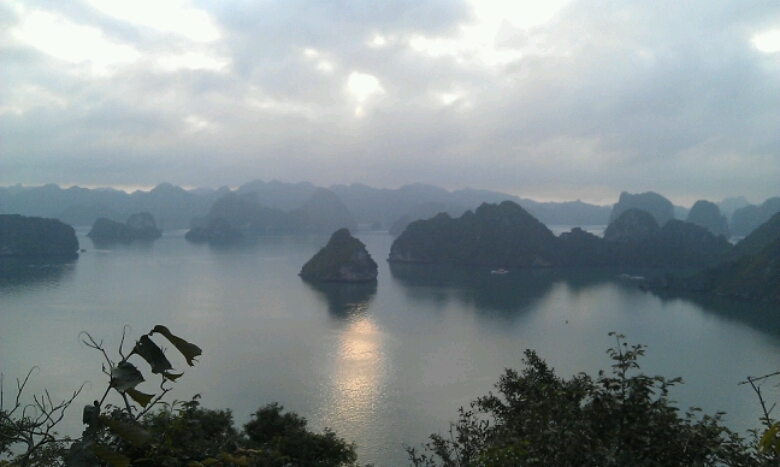 After looking at the guide books & online, Halong Bay appeared to be Vietnam’s ‘must see’. Therefore, we tried to reserve a bit of our budget over the month to be able to afford one of the cruises offered around the bay. Choosing a tour company to go with, is incredibly difficult & quite stressful when you are watching your budget & don’t want to waste your money. There are budget, mid-range & luxury options. Within those options, are a wide range of prices & operators available (and apparently a lot of scams & bogus tours). We finally settled on one our hotel recommended: Lemon Cruises (of course the hotel have their cut). We chose the 3 day tour format; one day cruise of Halong Bay & overnight on boat then Lan Ha Bay, then Cat Ba Island & overnight stay. 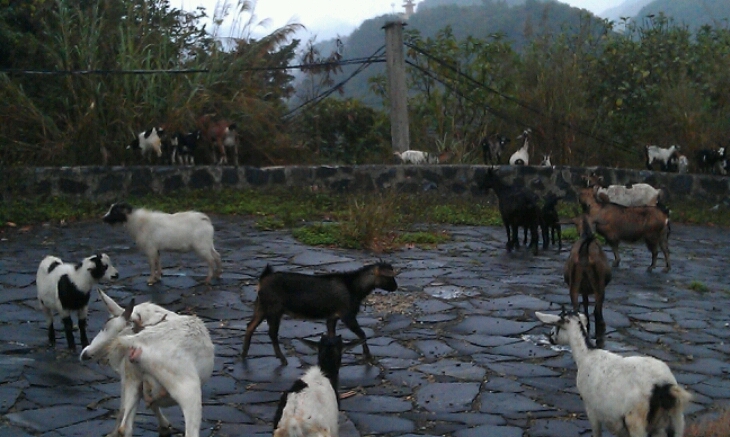 We asked to expand the trip by staying 2 nights on Cat Ba. To reduce the cost, we asked the tour operator to take out the suggested hotel cost & we booked our own room through Booking.com. We got a total reduction of $60 off the trip, then booked a private room at a hostel for 2 nights costing $24 total. Of course breakfast & dinner were additional, but we still came in under even though we stayed an additional night. 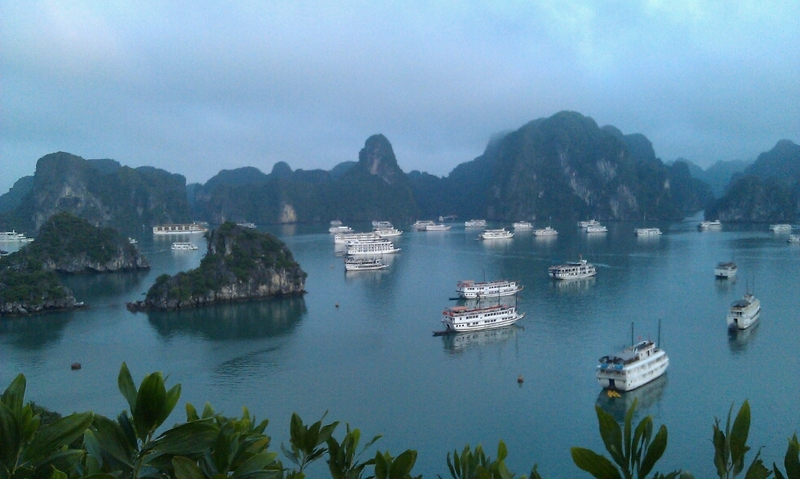 Ha Long Bay has an area of around 1,553 km2 ,including 1,960–2,000 islets, most of which are limestone. It was made a UNESCO World Heritage site in 1994. In 2007, a competition was held to find the ‘New 7 Wonders of Nature’. 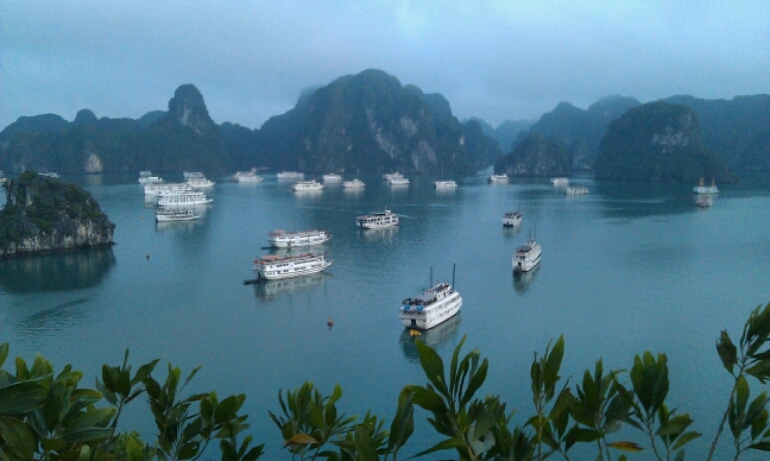 Halong Bay was included in the winning list. The name apparently means ‘Decending Dragon’, after an ancient legend. The legend says that when the country was newly formed, the Vietnamese had to fight against fierce invaders. Feeling sorry for the country, The Jade Emperor sent the Mother Dragon and her children to Earth to help the ancient people to defend the country. Our 3 day tour consisted of the popular 1 day/1 night tour, with additional content for day 2 morning plus overnight on Cat Ba. 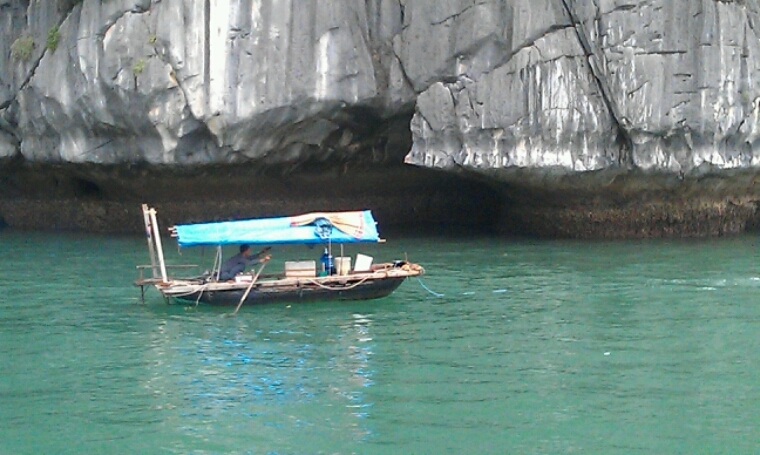 * Travel to Halong Bay by mini bus. * Transfer by tender to join cruise boat, then check in. We arrived & caught the small tender to the main boat. After sailing past some amazing boats & some shabby ones, we finally arrived at ours. If you ever visit, be aware there are hundreds of tour boats out in the bay, as the photos show (according to Travelfish there are ‘500 licensed junks, and on any given day, up to 300 of them may be plying the waters’). I could tell by the look on my fellow guests’ faces, that like me, at first sight we were a little dissapointed. The boat did not really look like the one in the brochure, from the exterior. However, once we had checked in, the room seemed ok & lunch was great, so we all felt a little more reassured. The visit to the caves is amazing & well worth it. Despite 3 previous kayaking ‘adventures’ with Colin over the years, I decided I would try once more. The sea in the bay is like a millpond & we both had a great time in the double kayak… We both wished we had longer than the 30 mins allotted. Next came the island &, both the weather & the rubbish in the sea, did not tempt us in for a swim. Instead most of us hiked up the 100s of steps to the top on the cliff to admire the amazing view. Finally back to the boat & showered, we were given a demo on making spring rolls & everyone dived in making them. Dinner was quite early, & after seeing the prices of drinks on the menu (don’t believe any advertising that states free anything. Prices are x3 or x4 what you pay on shore), none of us seemed interested in karaoke. The crew, after a few card tricks, ‘disappeared’ at 8oc to celebrate the last day of Tet on their own, & we were left alone. Some guests went to their rooms, four decided to hunt out the squid fishing poles and the rest of us sat on the top deck chatting & watching the lights on the neighbouring boats. We were all a bit disappointed. However, we met two lovely girls from Argentina, so had a chance to practice our Spanish. We woke up to rain, which literally put a dampner on some of our moods. 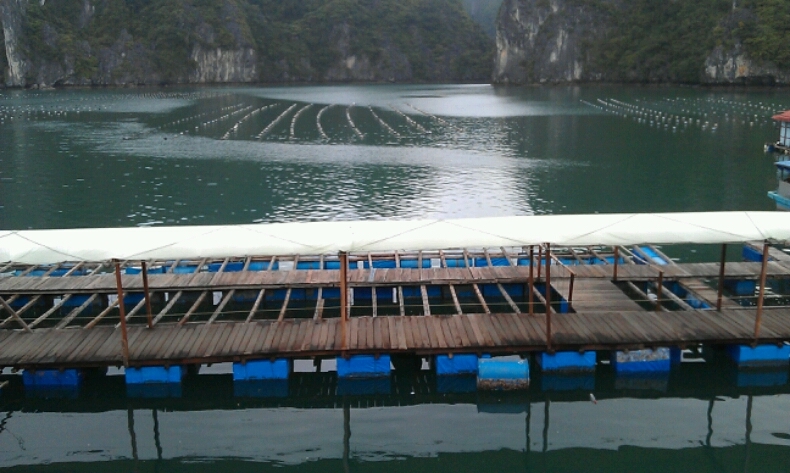 We had an early breakfast then off to a pearl farm, which was actually quite interesting. A couple if passengers, decided not to brave the rain & had a lie in. 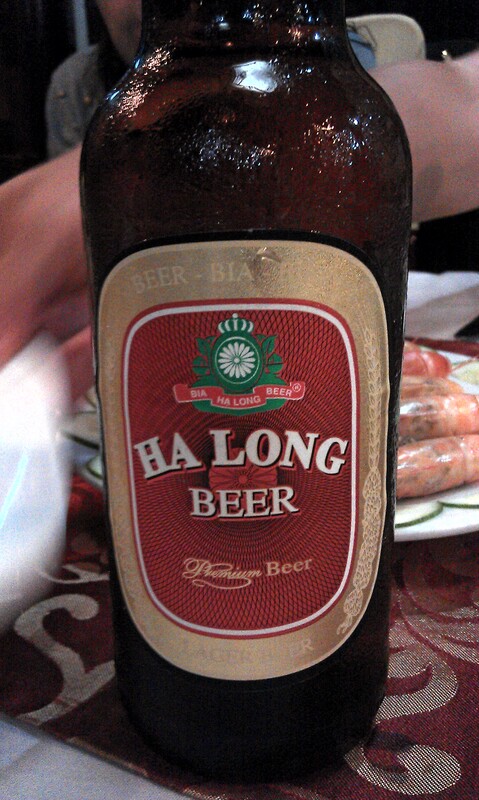 At this point, all the other guests were returning to Hanoi. Our tour guide seemed totally confused as we were the only couple going on to Cat Ba. Although he had arranged transport for us, he told us we would have to pay extra for the activities. We tried to clarify things & it just became more confused. A boat had come to collect us & in the end we got on it vowing to ourselves to complain as soon as we hit land. 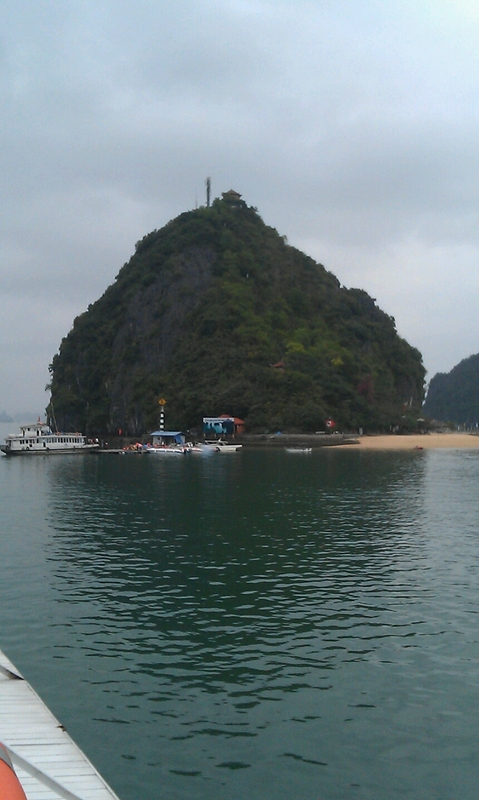 Do not miss a tour of Lan Ha Bay & Cat Ba Island if you get the chance! Our new tour guide was completely motivated & knew all about us & what we had booked. It was just us & the other couple from this point. 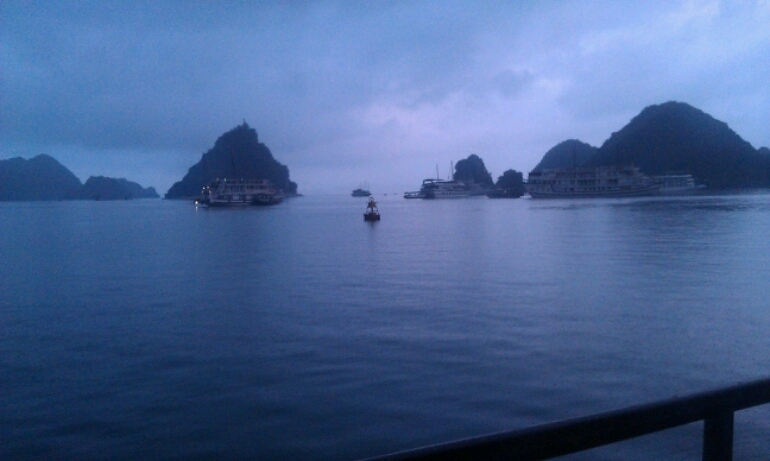 The hundreds of white cruise boats are not licensed to go into Lan Ha Bay, so from this point, we saw little traffic. 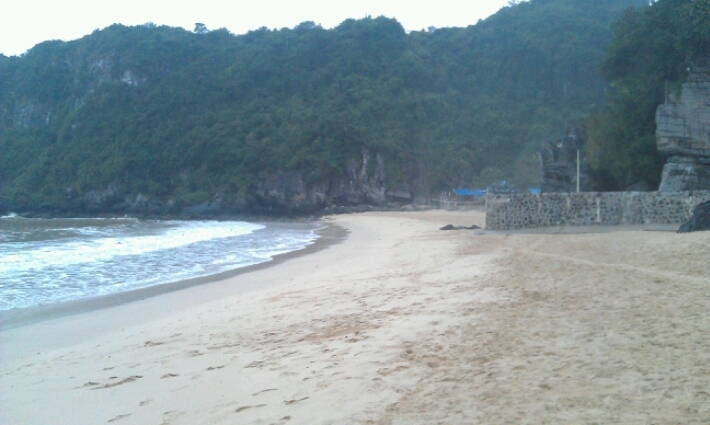 In our view, the scenery in Lan Ha is even more beautiful. The five of us cruised past amazing formations & fishing villages, seeing a few other tourists occasionally. 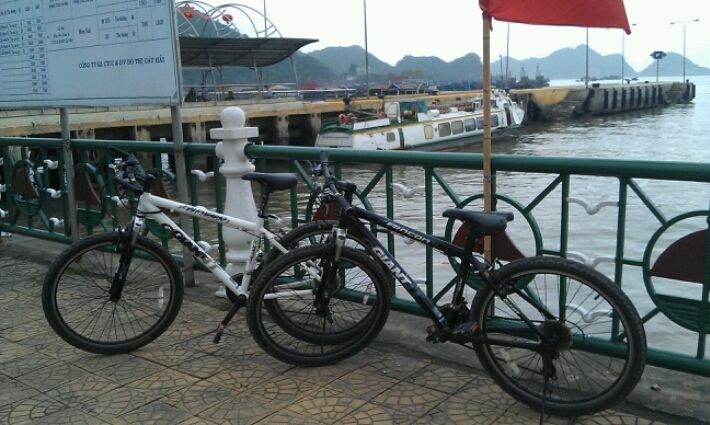 After sailing for an hour, we docked & got on bikes for a tour of the outskirts of the National Park. The scenery is amazing & it is so peaceful; we only passed 4-5 other tourists. We visited a local farming village which is transforming itself through tourism; they own all the bikes for example. It was quite a hard ride with no gears or suspension. We got back to the boat ready for the amazing lunch which had been made for us; yet more spring rolls, tofu, stir fried veg, grilled fish, clams & chicken in sauce & of course a huge bowl of rice. After lunch, we set sail for Cat Ba Port which took about 45mins through more amazing scenery. We arrived at the town to check in at our hostel. The main town seemed deserted during the day with everyone out on tours of the bay or Island, or on the beaches. At night it transforms with the restaurants busy, but not overly so. The town is a mecca for all things climbing, (we learnt a new term: ‘soloing’ which is rock climbing without ropes, then plumeting into the sea below). It is also the place for serious hikers within the National Park. There are plenty of other trips available & we could have arranged boat tours from here, if we hadn’t already done them. 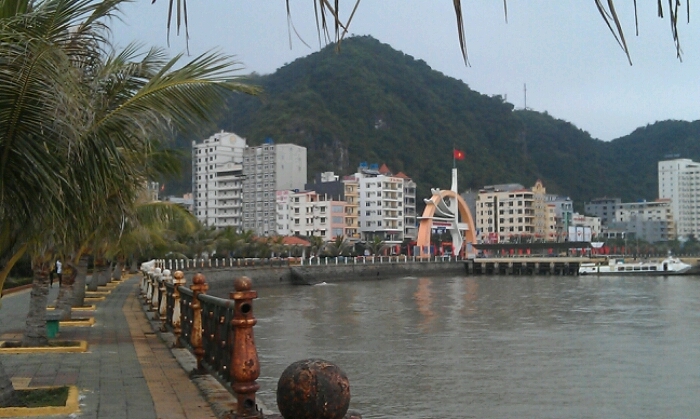 There are three beaches near to the town. We hired mountain bikes as although they are near, its extremely hilly. Unfortunately, it rained all morning & we sat under a sunshade for 15mins to shelter. When it became obvious it was going to remain foggy & wet for the rest of the day, we headed for The Fort. We did not realise this was such a steep road. For a serious cyclist this would have been a difficult ride. I personally felt like giving up at points; especially when a wild mother dog, with one eye, tried to attack us on the way up (both the bikes & a near bite of Colin’s ankle) & then on the way back down again (this time we had a large stick to wave, which dissuaded her somewhat). I know she was only protecting the puppies, but she didn’t have to be that scary. The only people we saw, were a couple of Korean girls on a moped & a Brit on our way down (who we warned about the dog). The fort was used in ‘The War against the Americans & French’ (as it is referred to by The Vietnamese). It has been turned into a very basic museum. It still has the ammunition cases, models of soldiers, cannons, bunkers & tunnels. It is a depressing place & you can imagine what it must have been like stationed there in the damp concrete bunkers & tunnels. Once we returned to the town, we grabbed a Vietnamese drip coffee. Next we did a loop via the port & around the back of town; again a series of steep climbs. That was enough cycling for one day. 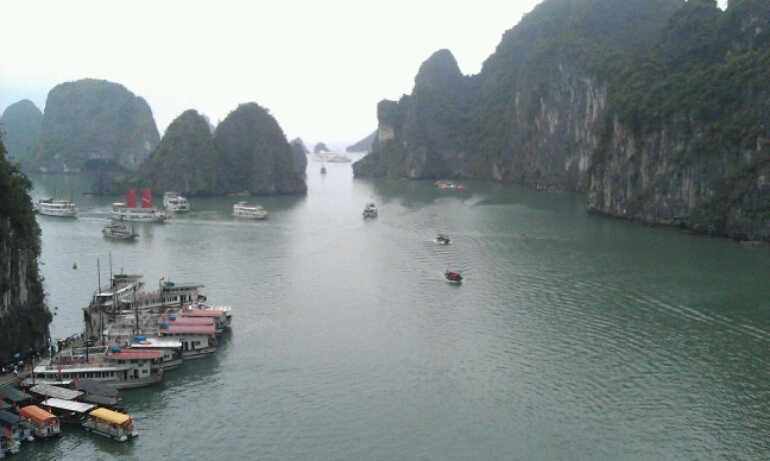 We were picked up at 7.30 & took a leisurely cruise via the fishing villages & more scenic views back to Halong City. We then took a bus to return to Hanoi as planned. 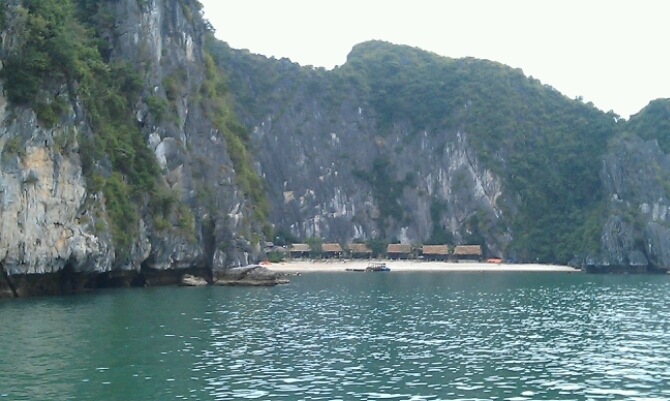 Despite some of the minor issues, I would thoroughly recomend touring Halong Bay & especially Lan Ha Bay. Cat Ba Island is worth a stop over & I could imagine filling several days if the weather is nice. We find Travelfish a good source of information, so if you are thinking of visiting take a look at the link above. Glad you had a good time despite some of the problems and obstacles! Was definitely a fantastic experience. 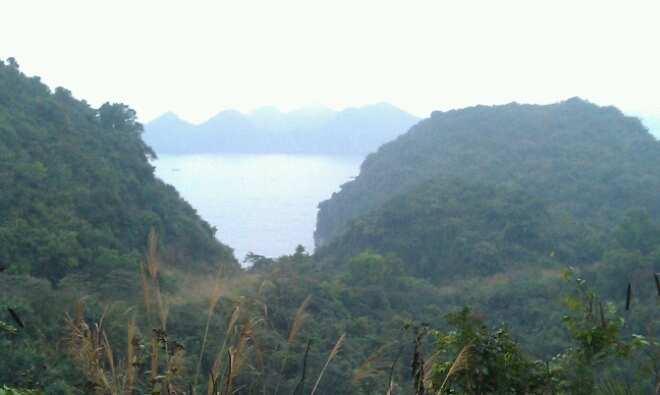 Not only Halong Bay but also the near by islands are lovely and very surprising. Loved the place a lot.